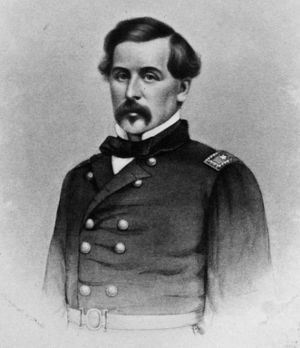 Thomas Francis Meagher, circa 1866. The life of Thomas Francis Meagher was one of honor and service. His death; however, has been shrouded with mystery and shame for the past one hundred-fifty years. On July 1, 1867, Meagher (pronounced Mar) fell from a steamship docked in Fort Benton, Montana into the Missouri river and was never seen again. Theories have been argued as to whether Meagher committed suicide, had a tragic accident, or was murdered. 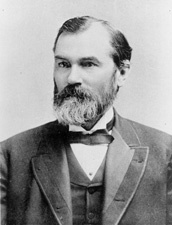 Authors such as Timothy Egan advocate the murder theory while Paul R. Wylie concludes it was an accident due to Meagher’s drunken state. Both theories have merit and substantial arguments as to their validity. Egan, like many before him, posits that Meagher was assassinated by political rivals. Given the circumstances in the region at the time and the men involved, this is not an unreasonable argument. Likewise, Wylie’s position that Meagher was intoxicated and fell into the unforgiving river is also cogent based on his history and penchant for alcohol. The possibility of this strong, Catholic man with a history of perseverance committing suicide is less likely but is not without merit as Meagher’s life was in a rapid state of decline. Although these theories differ in execution, they share the common thread of intoxication. Witnesses who claimed Meagher was killed said that he had been drinking, thereby making it difficult for him to defend himself. 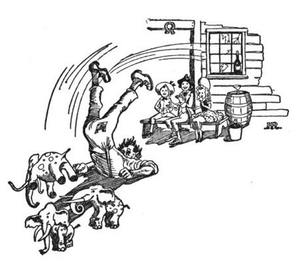 Both the suicide and accident positions claim inebriation was a factor in either a tragic fall or deliberate jump resulting from alcohol induced depression. A new and compelling theory will be presented here that also involves alcohol. Unlike the previous speculations, however; this conjecture is based on the absence of alcohol. It can be argued that Thomas Francis Meagher died from a seizure induced fall into the Missouri River as a result of the effects of Delirium Tremens (DTs) due to his sobriety. Thomas Francis Meagher was born on August 23, 1823 in Waterford, Ireland. At twenty years of age he joined the Young Ireland Movement and participated in the Rebellion of the Young Irelanders of 1848; an uprising and futile attempt at Irish independence. In July of that year, he was arrested and tried, where he was found guilty of treason and sentenced to death. His sentence was commuted to life imprisonment on Van Damien’s Land (present day Tasmania). Meagher made a bold escape in February 1852 and was rescued while floating at sea by an American whaler ship. He was transported to New Haven, Connecticut and from there migrated to New York City. As he was deemed a fugitive from justice, he was unable to return to England to be with his wife as she died from Typhoid Fever. In 1856, he married the prominent Elizabeth Townsend and became a staunch supporter of the Union in the growing tensions of the Antebellum Era in the United States. Meagher felt a great deal of gratitude for his adopted country and worked to instill that same feeling among his fellow Irishmen. Although jobs were scarce, wages were low, and racism was rampant, the Irishmen who made it to America were alive. Perhaps due to his political fervor or life on Van Damien’s Land, Meagher was a staunch Unionist and without hesitation enlisted in company K of the 69th New York Volunteer Regiment.The 69th engaged in combat at the First Battle of Bull Run. It was during this fight that the regiment lost its commander, Michael Corcoran, to an enemy prison camp after he suffered a wound to his leg.After this significant Union loss and an even greater loss to the 69th, Meagher returned to New York to recruit what he hoped to be an all Irish brigade. The oratory skills for which he was renowned did not fail him as he fired American patriotism into Irish hearts and minds. 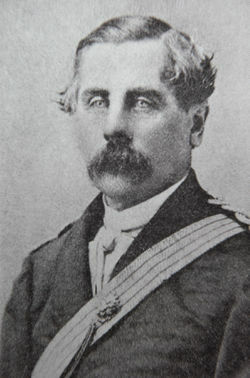 General Meagher's Civil War portrait. When the 69th returned to New York after the defeat at Bull Run, they were feted with a hero’s welcome from their adopted city. In order to bolster recruitment and support for the northern cause, Meagher accepted the invitation to speak at a “grand and enthusiastic festival,” that was being held to support the 69th’s widows and orphans.He urged his fellow Irishmen to “rise in defence [sic] of the flag,” that had harbored them safely from the “poison of England’s supremacy.”Although Meagher was sincere in his words of gratitude, he also had an agenda that was to benefit Ireland in future endeavors. He, like Corcoran before him, saw the American Civil War as an opportunity to train Erin’s sons on the battlefield so as to avail Ireland’s rebels with skilled and battle hardened soldiers. By divorcing himself from the Democrats in New York and supporting the emancipation Proclamation, Meagher alienated himself from his fellow Irishmen in America and in 1865 accepted the appointment to be the Territorial Secretary of Montana. He believed that the Irish-American community would thrive in the rural environment and on July 17, 1865, he headed west. On May 26, 1864 President Abraham Lincoln signed the Organic Act which officially named Montana as a separate territory; prior to this, the land was part of Idaho Territory. Sidney Edgerton presided as the first Territorial Governor. He was a Radical Republican abolitionist in a territory full of Union Democrats and Southern sympathizers. Upon Meagher’s arrival in the former territorial capital, Bannack City, on September 23, 1865, Edgerton departed with his family back to his home state of Ohio.When it became evident that he was not to return, Meagher became acting governor. In hindsight, Edgerton’s departure was wise as the tensions and vigilante justice were increasing in the region. Meagher's house in Virginia City, Montana. Edgerton’s nephew, Wilbur Fisk Sanders, formed the Vigilante Committee in December 1863. He and newspaper editor, Thomas Dimsdale, who initially welcomed Meagher warmly due to his reputation as a war hero, were unofficially in charge of what passed as justice at the time. Dimsdale, who was born in England, was irate at the actions of the Fenian Brotherhood, a group the Irish Meagher supported, and made his anti-Irish sentiments known in the media. Tensions with Meagher further increased when Meagher advocated for voting rights for African-American war veterans and denounced the poor treatment of Native-Americans in the region. Additionally, Montana Territory at the time was overwhelmingly anti-immigrant and anti-Catholic, of which Meagher was both. Opposing political, religious, and cultural views certainly alienated Meagher from the leading citizens of the region and tensions continued to boil. The Vigilante Committee demonstrated little hesitation when doling out frontier justice as they were led by the prominent Mason Wilbur Fisk Sanders, newspaperman and author Thomas J. Dimsdale, and Judge Lyman Munson, all of whom hated Meagher with a violent passion. Had he not died in 1866, Dimsdale may have been suspected in having Meagher assassinated as he was fervently anti-Irish, had publically argued with Meagher, and believed firmly in vigilante justice, so much so that he wrote a book advancing the practice.Other theories continue to be debated regarding who may have murdered Thomas Francis Meagher. One of the most widely held and very plausible opinions is that Meagher was killed at the hands of Wilbur Fisk Sanders. He was the founder and leader of the Vigilante Committee, possessed vast monetary resources and had personal access to vigilantes who felt as he did towards Meagher. Additionally, and oddly, he was the man with who Meagher spent his last day. He also had a political motive for eliminating the Irishman as Fisk held ambitions of being a U.S. Senator and feared that Meagher would stand in his way. Unbeknownst to him, and most everyone, Meagher had no inclination to further his political career. In fact, a new governor to Montana was appointed by President Andrew Johnson and Meagher had resigned his post as Secretary of the territory. His last official act was to travel to Fort Benton, Montana on July 1, 1867 in order to proceed one hundred twenty miles down the Missouri river by steamboat to retrieve rifles sent by General Sherman for the purpose of protecting Montana citizens from a perceived Indian threat. General Meagher wanted to live the remainder of his life in solitude and out of the public eye. Sanders was supposedly unaware of this, however; eyewitness accounts and his own testimony swear that the two men spent the entire day together in Fort Benton. It is very plausible that at some point these two outspoken politicians discussed plans for their futures. Neither man was shy about expressing himself or about prodding others for information. It can therefore be argued that Sanders did in fact know that Meagher had no intention of obstructing his path to the U.S. Senate, thus eliminating Sanders’ motive for wanting Meagher eliminated. Without a motive and with the knowledge that Meagher was no longer a threat politically or in any other fashion, Sanders had no reason to have Meagher murdered. That being the case, other suspects can be addressed. Crowd gathers for a vigilante lynching in Helena, Montana, circa 1870. Judge Munson has been mentioned as a possible assassin due to his outrage over the Daniels affair the previous year. He, too was a member of the Vigilante Committee with vast resources. One must ask; does an overturned sentence to a relatively obscure citizen warrant the assassination of a man one year later? If Munson was so inclined to have Meagher murdered, why would he wait a full year? Meagher could have been captured and killed anytime over that span and any of the hundreds of vigilantes in Virginia City would have been accused. No, if Munson wanted Meagher dead, he would have acted sooner and in a more logical fashion. Another theory that has received some consideration is that the English came for Meagher. Although Meagher was technically a fugitive from the Crown’s justice, it is unlikely that England sent a force to capture or kill him at that particular time. As commander of the Irish Brigade, Meagher’s whereabouts had never been a secret, giving a foreign government ample opportunity to arrest him. Further, if the British did in fact catch up with Meagher, they would have brought him back alive to use as an example to others wanting to rebel against England. There were, however; British soldiers in Fort Benton that day to investigate a reported plot against the Crown by the Fenian Brotherhood. Several days prior to Meagher’s death an Irish-American cavalryman killed a captain in the English Army about another steamboat on the Missouri. It has been speculated that killing Meagher was a form of English retribution, yet no suspects have ever been named. Another theory is that Meagher was killed by angry Native Americans who were unhappy with recent treaties presented by Meagher. This is also unlikely as Meagher was exposed while on route to Fort Benton for more than a week. He was much more susceptible while on a trail in the wilderness than he was in a populated town where he was rarely alone. This theory is highly unlikely. By eliminating Sanders, Munson, Indians, and the British the murder hypothesis can be considered highly unlikely. It has been speculated that Meagher killed himself intentionally. He was in a great amount of debt and reportedly quite ill. Conflicting reports at once state that he and his wife were happy together and were having marital problems. He continued to drink regularly and at times heavily. His career was at an end and he saw no future prospects. These are all profound reasons for a man to plunge into a state of deep depression. Meagher, however; was no ordinary man. He had led a rebellion in Ireland, escaped Van Damien’s land through shark infested waters and survived in the ocean until found by a whaling boat. He thrived in the U.S. as an orator for the Irish cause and as a Brigadier General who commanded one of the most famous military units in U.S. history. He travelled across the country to govern a hostile territory and gave fierce battle to his most ardent political rivals. More importantly still, he was Catholic. Devout Catholics do not commit suicide. In the summer of 1866 he travelled the region with his wife and spent a considerable amount of time with the Jesuit priests who he considered friends. Father William Corby, one of the priests of the Irish Brigade during the Civil War spent a good deal of time with Meagher and knew him well. In his memoirs, he remembered Meagher as a man who was “strong in his faith…and wherever he went made himself known as a ‘Catholic and an Irishman’. He was well instructed in his religion… and did not neglect going to confession from time to time.”For a practicing, devout Catholic to commit suicide is unthinkable. By continuing to visit the Jesuits and practicing his faith regularly, Meagher’s actions make it is nearly impossible to believe that an intelligent, strong, and unyielding Catholic killed himself. Thomas Francis Meagher enjoyed drinking alcohol and he did it often; daily. This was a lifelong vice that can be categorized as an addiction. To believe Meagher was drunk the night he died, July 1, 1867, and as a result had a terrible accident and fell from the deck of the G.A. Thompson to his death in the unforgiving Missouri River is a completely credible opinion. The problem with this premise, however; is that all but one of the eyewitness accounts report that Meagher had no alcohol that day. He spent the day with Sanders in Fort Benton, who reported that Meagher refused all offers of alcohol. Other witnesses reported the same, with the exception of the seventeen year old wife of Indian agent James Wright. Meagher and Wright had several conflicts of Indian treaties and treatment. By July 1867, Wright, along with another Indian agent, August Chapman, despised Meagher to the point of threatening his safety. Both men regularly denounced his character due to his public drinking. Wright’s wife is the only witness to claim that she saw Meagher, Johnny Doran, the pilot of the boat, and the boat’s captain, James Woods, drinking in the salon room of the riverboat.This was reported to have taken place in the evening. As this account came from a seventeen year old girl married to a man who hated Meagher, this testimony must be scrutinized and eliminated as fact. Another witness claims to have seen Meagher and fellow Irishman Doran returning to the boat after dark, but did not elaborate on the condition of the men. Since the preponderance of evidence states the Meagher was sober at the time of his death, the only opposition to this being the testimony of a young girl who was married to a man who hated Meagher, it is reasonable and prudent to conclude that Meagher was sober at the time of his death. Since suicide, murder, and a drunken accident have been eliminated, a new theory of a sober death must be the answer to this one hundred-fifty year old mystery. Delirium Tremens (DTs) is a life threatening condition. The condition has a sudden onset and symptoms present anywhere from forty-eight hours up to seven days from the time of the last alcoholic drink. The symptoms, which include paranoia, hallucinations, increased perspiration, seizures, cognitive distress, imbalance, abnormal heart rhythms, and loss of consciousness, are exacerbated with the presence of an infection in the inflicted person.Some of the physical symptoms mirror those of intoxication. Because of his history with alcohol, if Meagher demonstrated any of these symptoms, it would have been believed without hesitation that he was drunk. The problem is that he was not seen drinking by a reputable witness. On his way to Fort Benton, Meagher stopped for six days in Sun River, Montana. It was reported that he drank considerably for most of his stay and that he also suffered from dysentery. It is entirely sound to speculate that Meagher’s dysentery, something from which he suffered regularly, was caused by an intestinal infection. Suffering greatly before he and his twelve companions broke camp in Sun River, Meagher opted to forgo alcohol until his intestines were healed. 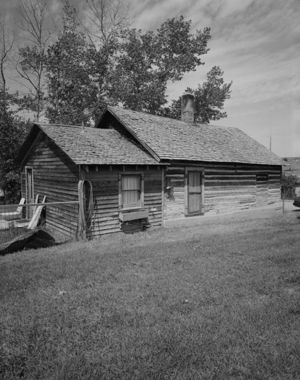 At the time of his arrival in Fort Benton, Meagher had been without alcohol for at least forty-eight hours and was suffering through an intestinal infection. A rather heartless depiction of a man suffering from DTs and tripping over his hallucinated Pink Elephants. It is also agreed upon in the medical and psychiatric community that the symptoms of DTs are “characteristically worse at night.”Both Sanders and Doran attested that Meagher’s mental state deteriorated at dusk. He noted that Meagher appeared paranoid and delusional “‘about dusk.’” Sanders stated, “‘It was apparent that he was deranged. He was loudly demanding a revolver to defend himself against the citizens of Fort Benton who, in his disturbed mental condition, he declared were hostile to him.’”Sanders and two or three others accompanied Meagher to his room aboard the steamship. Doran watched as the general removed his clothes and prepared for bed. He claimed to have been the last man to speak with Meagher. That night, which was described as being well lit by the moon, the sentry aboard the G.A. Thompson saw “‘somebody moving in white clothing toward the left rear.’” The same man heard a “‘shout and a splash,’” then he shouted, “‘man overboard.’”The area to which the sentry referred was the location of the temporary toilet. Given Meagher’s condition of intestinal distress, it is quite likely the man the sentry saw was Meagher. Several other witnesses claim to have seen a man fall from the deck into the river that night. The sentry’s description of the man in “white clothing,” the predominant color of bed clothes or undergarments of the time, falling from the area of the toilet facilities, where a man with severe dysentery would be, leads to the conclusion that the man seen by the sentry was in fact Thomas Francis Meagher. Identifying that man as Meagher thereby identifies him as the man who fell overboard. He was not pushed, stabbed, or shot; he fell. Suffering from Delirium Tremens, General Meagher had either a seizure or cardiac event so severe that he lost consciousness and fell to his death in the Missouri River. It has been noted that Meagher was an excellent swimmer as he was raised close to water. Regardless of his aquatic skills, a very ill man who recovered consciousness only when hitting cold water which would have exacerbated any cardiac event̶ he would not have been able to navigate the waters of the river. Johnny Doran, who was the pilot of the steamship that traversed the river regularly, noted that he did not jump in to help as it “‘would not only have been useless but almost certain death, as the river there was about twelve feet deep, and with a current rushing at a rate of nine miles an hour.’”It can therefore be deduced that if a healthy Doran was certain he could not survive in the river, a sick man suffering from DTs and its associated complications would certainly perish. General Thomas Francis Meagher was a hero to both Ireland and the United States. He made many enemies over the years of his service to both countries, a fact that cannot be disputed. His enemies did not kill him. The war did not kill him. Meagher died as a result of his own addiction and the unforgiving nature of the Missouri River. ↑ Timothy Egan, The Immortal Irishman (New York: Mariner Books, 2016). Paul R. Wylie, The Irish General: Thomas Francis Meagher (Norman, OK: The University of Oklahoma Press, 2007). ↑ Cal McCarthy, Green, Blue, and Grey: The Irish in the American Civil War (Cork, Ireland: Collins Press, 2009), 45. ↑ D.P. Conyngham, The Irish Brigade and Its Campaigns, ed. Lawrence Frederick Kohl (1866; repr., New York: Fordham University Press, 1994), 41. ↑ Virginia City, MT became the territorial capital on February 7, 1865. Helena became the capital city in 1875. ↑ Angela Faye Thompson, "Death of Thomas Francis Meagher revisited" (1998).Theses, Dissertations, Professional Papers. Paper 1993. http://scholarworks.umt.edu/etd. ↑ Daniels Pardon, February 22, 1866, Montana Historical Society, quoted in Wylie, 263. ↑ Lyman Munson, quoted in Wylie, 264. 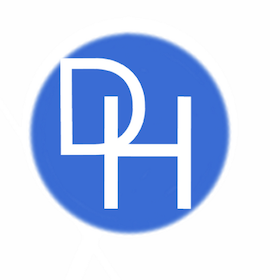 ↑ Dimsdale’s book is now in Public Domain. See Thomas J. Dimsdale, The Vigilantes of Montana: Or Popular Justice in the Rocky Mountains (Montana, 1866). It is interesting to note that this was the first book ever published in Montana Territory. ↑ William Corby, Memoirs of Chaplain Life: Three Years with the Irish Brigade in the Army of the Potomac (New York: Fordham University Press, 1992), 28-29. ↑ Michael James Burns, MD, “Delirium Tremens (DTs) Clinical Presentation,” Medscape, March 2017, http://emedicine.medscape.com/article/166032-clinical. ↑ Michael Gelder, Richard Mayou, John Geddes, Psychiatry (Oxford Core Texts), 3rd ed. (New York: Oxford University Press, 2006), 188. ↑ Sanders, quoted in Wylie, 315. ↑ Michael Cavanagh, Memoirs of Gen. Thomas Francis Meagher (Worcester, MA: Messenger Press, 1892), 12-13. ↑ Doran, quoted in Wylie, 318.